The folks at Taco Bell call it a “doozy of a story” and it is. Lynden companies are often called upon to make the impossible possible in Alaska and, sure enough, Lynden was involved in this unforgettable story. Someone in Bethel, AK (population 6,200) started a rumor that a Taco Bell was coming to town. Fliers were posted around town announcing the fast food restaurant’s impending arrival. For Bethel, this was big news. Accessible only by air or sea, the nearest Taco Bell is four hours away in Anchorage. Unfortunately, the rumor proved to be an elaborate hoax. When Taco Bell's creative marketing department heard about the rumor, it decided to turn the hoax into a public relations opportunity. The plan? 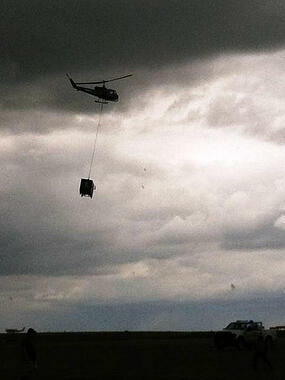 Fly a taco truck to Bethel via helicopter and load it with enough ingredients to serve every person a fresh, hot taco. It would be a taco bell restaurant on wheels – at least for a day. That’s where Lynden comes in. According to Lynden International Account Executive Greg Obeso, Lynden’s hat was already in the ring for transporting Taco Bell’s supplies to Bethel because of its outstanding performance handling logistics for the Discovery Channel’s “Deadliest Catch” and other programs over the past three years. One Los Angeles producer knew another producer and the Lynden recommendation sealed the deal. In the hours leading up to the taco truck “drop,” Lynden moved 950 pounds of seasoned beef, 500 pounds of sour cream, 300 pounds of tomatoes, 300 pounds of lettuce, 150 pounds of cheddar cheese and 10,000 taco shells along with refrigerators, heating units, cooking utensils and packaging materials. Approximately 30,000 pounds of food and gear was loaded onto one of Lynden Air Cargo’s Hercules aircraft in Anchorage along with the Operation Alaska taco truck (pictured at right) that was later lowered into Bethel. Approximately 40 Taco Bell employees were flown in to serve the community and help out. Now that Operation Alaska is complete, Greg says Lynden will move the taco truck back from Bethel to Anchorage, load it on an Alaska Marine Lines barge for Seattle and then haul it to Irvine, CA via Lynden Transport. 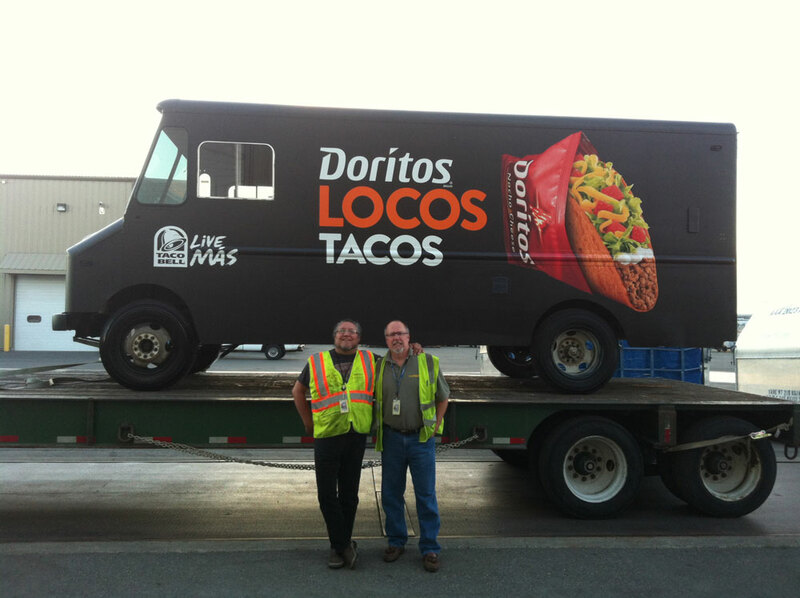 The truck is slated to be displayed at Taco Bell’s California headquarters as a reminder of the “doozy” of a story. See the story for yourself at http://www.tacobell.com/discover/.